Hello, I’m Murray Susser, MD (I’m also Hayley’s grandfather), and I formulated the supplements you see on this page: Primal Boost and Primal Balance. 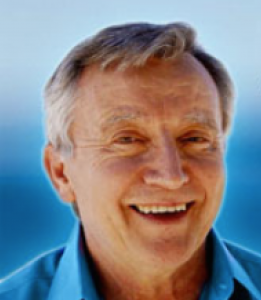 I’ve been involved in Nutritional and Alternative medicine for over 40 years. In fact, I was one of the first MDs to be involved in nutritional and alternative medicine. I graduated from Pitt Medical School in 1966, so that gives you an idea of how long I’ve been doing this. Early on in my practice, I realized that orthodox medicine that didn’t satisfy all my patients’ needs, so I got into nutritional and alternative medicine; and that’s been a marvelous odyssey ever since. I have not discarded orthodox medicine at all; rather I have included it in a holistic approach to healing. I like to think I’ve been on the cutting edge of ancient medicine. Ancient medicine is important, because we know that really good medicine goes back at least 2400 years to Hippocrates, ‘The Great Healer’, around 400bc. I created Primal Boost and Primal Balance through years of clinical experience to help treat common imbalances and deficiencies that can be easily avoided. Primal Boost is a combination of adrenal and thymus, which can help with the body’s ability to combat stress, improves immune function, and optimizes adrenal function. Primal Balance, on the other hand, is a powerful combination of lipotropic factors which aid in fat metabolism and help balance hormones, which is especially important for women. 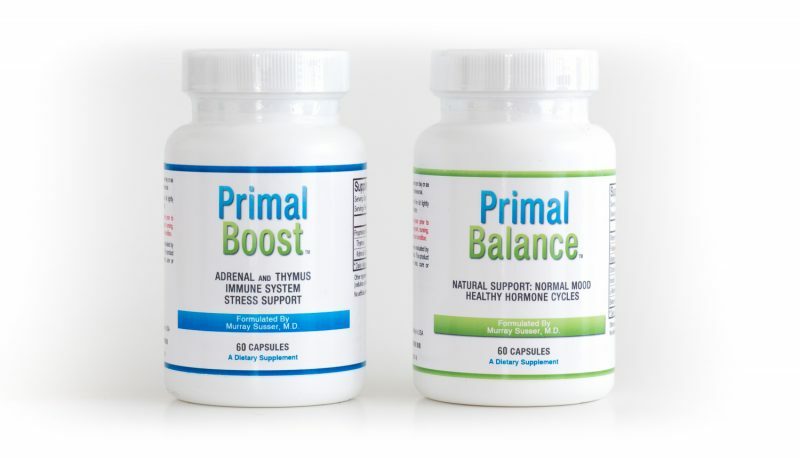 Taken together, Primal Boost + Primal Balance provide a unique supplemental solution to help support your body’s response to stress and promote natural hormonal balance. If you have questions about Primal Boost and Primal Balance, feel free to submit a question to me at the bottom of this page. Be it adrenal fatigue, hormonal imbalances, lyme disease, or broad based general medicine, I tenaciously devote my energies, my expertise, and all my senses to the pursuit of good health. Stress is caused by physiological, psychological, or emotional triggers (stressors) that cause a disturbance in the homeostasis of an organism. How we respond to those stressors (physiologically and psychologically) influences how well we cope with change and with ongoing stress. Structural or physical trauma, distress, poor diet, infection, toxic exposure, leaky gut, births, deaths, lack of sleep, temperature changes, electromagnetic radiation, and allergies or food sensitivities are all potential stressors. Combined, they amount to a total stress level and can ultimately disrupt homeostasis with direct effects on the autonomic nervous system, the hypothalamic-pituitary adrenal (HPA) axis, and the cardiovascular, metabolic, and immune systems. The pioneering endocrinologist, Hans Selye, identified the various stages of the stress response (alarm, resistance, and exhaustion) and described the entire phenomenon as the general adaptation syndrome (GAS). Adrenal: The adrenal glands (also known as suprarenal glands) are endocrine glands that sit at the top of the kidneys. They are chiefly responsible for releasing hormones in response to stress and well being. When you think of the adrenal glands, stress might come to mind. And rightly so—the adrenal glands are arguably best known for secreting the hormone adrenaline and cortisone, which rapidly prepares your body to spring into action in a stressful situation. But the adrenal glands also contribute to your health and well being at times when your body isn’t under extreme stress. In fact, they release hormones that are essential for you to live. Thymus: Thymus extract is commonly used to stimulate the immune system and to treat bone marrow failure, autoimmune disorders, chronic skin diseases, recurrent viral and bacterial infections, hepatitis, allergies, chemotherapy side effects, and cancer. The importance of the thymus in the immune system was discovered in 1961 by Jacques Miller. As the thymus is the organ of T-cell development, any congenital defect in thymic genesis or a defect in thymocyte development can lead to a profound T cell deficiency in primary immunodeficiency disease. Defects that affect both the T cell and B cell lymphocyte lineages result in Severe Combined Immunodeficiency Syndrome (SCIDs). What’s unique about this formulation? On the market, there are a lot of different combinations, and a lot of different ways to deal with the need for adrenal and the need for thymus tissue. The adrenal and thymus, when taken together, allow your immune system to fight harder. Your immune system is much more comfortable dealing with stress and injury, when the adrenal gland has become exhausted, it takes good nourishment in general, and a combination of adrenal and thymus to get the best possible results. Suggested Use: Take one capsule per day, or as directed by a healthcare practitioner. Supplement Ingredient Source: The extract material is from bovine, and is of the highest quality and purity obtainable, and does not contain preservatives, diluents, or artificial additives. This product does not contain Gluten. Formulated by Murray Susser, MD. Primal Balance is a proprietary combination of Lipotropic factors. Lipotropic compounds help catalyze the breakdown of fat during metabolism. Lipotropic nutrients promote and encourage the export of fat from the liver. They are necessary for maintenance of a healthy liver and fat burning and the exported fat for additional energy. Without lipotropics, such as choline and inositol, fats and bile can cause problems in the liver and fat metabolism. The great nutritionist, Dr. Carlton Fredericks, taught me about these metabolic problems about 40 years ago. Since then I have used this kind of nutritional aid in thousands of patients. B vitamins (B6, B12): The water-soluble B vitamins have to be absorbed in the small intestine and then go to the liver where they are bio-transformed into their active coenzyme forms. B vitamins are involved in many aspects of macronutrient metabolism, neurotransmitter synthesis, histamine synthesis, hemoglobin synthesis and function. B vitamins help balance hormonal changes in women (and men) and aid the immune system. Women use lipotropic B vitamins for premenstrual syndrome (PMS) and other menstruation problems, “morning sickness” (nausea and vomiting) in early pregnancy, stopping milk flow after childbirth, depression related to pregnancy or using birth control pills, and symptoms of menopause. Choline is the major lipotropic in mammals, as it is essential for fat metabolism, functioning as a methyl donor (which is required for proper liver function). Choline is an essential nutrient in the production of phosphatidylcholine, one of the most important structural building blocks of a living cell. Choline is the backbone of a nervous system signal molecule—or neurotransmitter—called acetylcholine. The importance of acetylcholine cannot be overstated. The part of your nervous system that runs your heart and keeps your intestines moving along runs largely on acetylcholine. Similarly, any muscle you move requires a signal of acetylcholine to tell it to contract. Choline assists detoxification reactions in the liver. Inositol, unofficially referred to as “vitamin B 8 ,” is present in all animal tissues, with the highest levels in the heart and brain. It is part of the membranes (the outer coverings) of all cells, and plays a role in helping the liver process fats as well as contributing to the function of muscles and nerves. Inositol may also be involved in depression. People who are depressed may have lower than normal levels of inositol in their spinal fluid. In addition, inositol participates in the action of serotonin, a neurotransmitter known to be a factor in depression and insomnia. (Neurotransmitters are chemicals that transmit messages between nerve cells.) For these two reasons, inositol has been proposed as a treatment for depression, and preliminary evidence suggests that it may be helpful. L-Methionine, an essential amino acid, is a major lipotropic compound in humans. When estrogen levels are high, the body requires more methionine. Estrogens reduce bile flow through the liver and increase bile cholesterol levels. Methionine helps deactivate estrogens. Methionine levels also affect the amount of sulfur-containing compounds, such as glutathione, in the liver. Glutathione and other sulfur-containing peptides (small proteins) play a critical role in defending against toxic compounds. When higher levels of toxic compounds are present, more methionine is needed. Folate (as Quatrefolic®) Generically known as folate, 5-methyltetrahydrofolate (5-MTHF) is the most biologically active form of the water-soluble B vitamin, folic acid. It is the form into which the body must convert all other forms of folic acid before it can be used. Along with vitamin B12, 5-MTHF serves as a donor of methyl groups. The body utilizes methyl groups in many nervous system and metabolic processes, including the conversion of homocysteine to methionine, the synthesis of neurotransmitters, the production of melatonin, and the synthesis of DNA. In addition, sufficient folate is necessary for brain and nervous system functions. Good folate status is associated with a healthy mood and maintaining a sense of calmness. Folate intake is especially important for women of child-bearing age. Studies indicate that supplementing during pregnancy supports a healthy outcome. Primal Balance also contains a small amount of Betaine HCl, which helps promote healthy digestion. Suggested Use: As a dietary supplement, 2 capsules daily with a meal, or as directed by a healthcare practitioner. Supplement Ingredient Source: The ingredients are of the highest quality and purity obtainable, and do not contain preservatives, diluents, or artificial additives. This product does not contain Gluten. To the extent that any information is provided here, it is for general informational purposes only and is not intended to constitute or substitute for (i) medical advice or counseling, (ii) the practice of medicine including but not limited to psychiatry, psychology, psychotherapy or the provision of health care diagnosis or treatment, or (iii) the creation of a physician-patient or clinical relationship. These products are not intended to diagnose, treat, cure, or prevent any disease. Consult your physician prior to using these products if you are pregnant, nursing, taking medication or have a medical condition.